Micro usb cable are most popular devices for USB data connectivity connector. That's for we show you Micro usb data cable technical review and it will help you for finding easily D+ D-(Data +, Data -) Vbat & GND connection in micro usb cable. 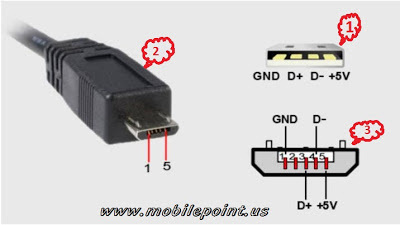 How to connect a mobile in USB mode or Flash box mode? This four pin wire cable opposite side of micro usb connector. This main layout view of micro usb connector it will identify you which pin D+ D- and which Vbat, GND between 5 wire.